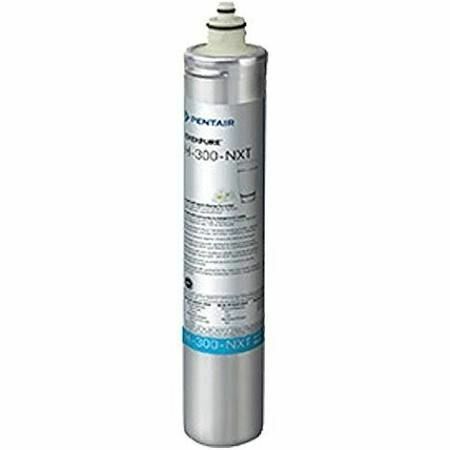 Superwater.com offers Discounted (**Class A ) Shipping on Every # EV9274-41 Pentair Everpure H-300+NXT Water Filter Cartridge Order . NOTE: This Everpure Filter will 100% replace your older Body Glove # WI-BG3000R Filter Cartridge and at a much lower cost. **Class A Shipping is Applied Only One Time Per Order. ***WE ARE AN AUTHORIZED PENTEK PENTAIR EVERPURE FOODSERVICE, COMMERCIAL and INDUSTRIAL DEALER WITH OVER 25+ YEARS EXPERIENCE. Questions?....Please Call Us. - Lead Reduction to below the Federal Action Level of 15 ppb - Cysts such as Giardia lamblia, Entamoeba histolytica and other Bacterial Agents. - Volatile Organic Chemicals (VOCs), including THMs. - A bacteriostat agent to combat the growth and reproduction of bacteria within the cartridge. - A 1/2 gallon per minute flow rate. - The Pentair Everpure # EV927441 H300+NXT Cartridge features exclusive Precoat design and Enhanced KDF Media which removes particles up to a 1/2 (.05) micron and larger in size. - Reduces lead up to 99% and Volatile Organic Chemicals and other suspected carcinogens. Precoat design removes particles 1/2 micron and larger in size including Cyptosporidium, dirt, bad taste and odor, chlorine, mold and algae. - Scale inhibitor blended into the Micro-Pure� material reduces mineral build-up in water using appliances. - Sanitary quick change cartridge is very easy to install and replace.